So how were your holidays, Earth Girl? 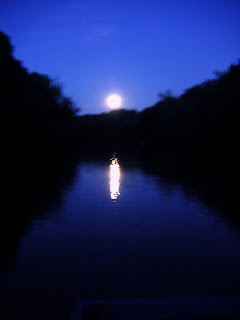 The moon was full and the night was cold. Our impossible mission was to find a tree that would fit in the house. In 1995, we planted 25 Scotch pines on our tree farm to provide us with Christmas trees, but they have grown like Topsy, not pruned into the ideal conical Christmas tree shape. After wandering up and down Christmas tree row (watch out for the briars! ), the beam of our flashlight at last lighted a passable specimen, a 30 foot specimen. We cut it off midway and brought it home. We cut it off again. And again. The tip of the tree that made it into the stand in our house was a poor reflection of the nicely shaped tree we saw in the moonlight. Lights and ornaments and huge sprays of red berries disguised a lot of imperfections. Kolachi, date balls, key lime cookies, homemade caramels, lemon coconut squares, cut-out sugar cookies, cranberry bread, crispy cookie coffeecakes, lemon balm pound cake. No wonder my pants are snug this morning. I am not a crafty person (in all senses of that phrase). But I decided to make a scrapbook for my mother-in-law chronicling her birthday party and their fall hayride. This took me hours, but I improved as I completed page-after-page. She loved it, especially the pictures at the sand pit, the hayride destination, because she could not ride in the wagon and missed that fun. I have been working on compiling Mom's recipes into a cookbook as a gift to my family for over three years now. Family pictures and stories are interspersed throughout the cookbook. It's at the place where I need a killer design for the cover and a really good editor. When I look at it, I love it and I hate it. I think that is about normal for such a project. 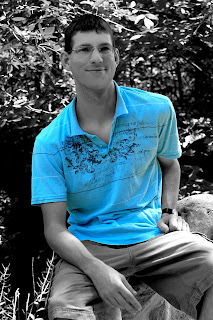 My niece Jennifer agreed to edit it, so perhaps this gift will be ready to print soon. A few years ago, REMC buried the lines in our heavily wooded neighborhood because we often lost power. When the bad ice storm hit, we had power. We lent our two kerosene heaters to friends without power. Then on Sunday as temperatures hit subzero, we lost power. Steve started the generator and we plugged in a small electric heater. As he went to retrieve one of our kerosene heaters, Ricky and I played word games by candlelight. (Steve didn't understand why we didn't plug a lamp into the generator, but candlelight was much more dramatic.) 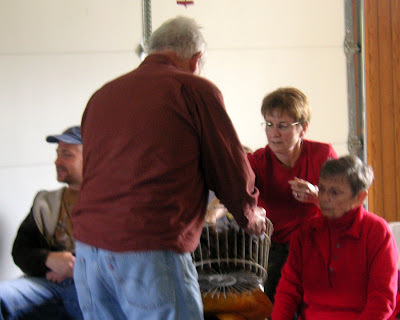 When he got home, we gathered up an elderly neighbor and her dog and brought them to our house. Her plan was to crawl into bed and heap on the quilts. As soon as we settled in, power was restored. I am so blessed to have a competent prepared husband. If I hear this one more time from one son, I'm going to scream! OK, so I did respond several days ago with "So, I'm 59." He thinks our rules, especially curfew, no longer apply to him. This "letting go", a euphemism for ripping apart the family structure, is not easy on either the parents or the sons. I just can't wait for him to be fully emancipated and our relationships restored. If you think I'm being overly dramatic, you have not experienced this stage. As parents, we have worked hard toward the goal of independence for him, but he is so immersed in it that he can't see that we are all working to the same ends. The biggest sticking point is "If you live in our house, you obey our rules." I am gobsmacked that this article was published in The Times (UK): As an atheist, I truly believe Africa needs God. I hardly ever (never?) read positive articles about Christians, let alone missionaries, in the secular press, but I have heard first-hand testimony to their effectiveness my whole life. 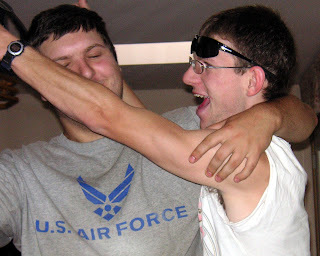 I just learned that my nephew (named for my father) returned safely from Iraq. After a few days in Indianapolis, he will be home. Hopefully, he will be home in time for our family's Thanksgiving dinner on Saturday. Thank you God for Lawrence's safe return! 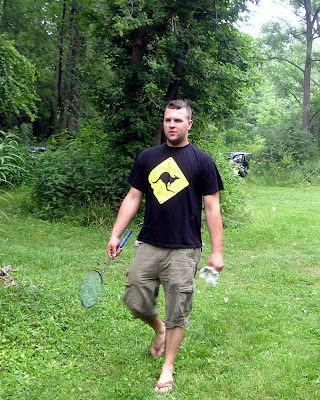 Here he is playing badminton last July at the river, when he was home on leave. Meanwhile, I better get back to cleaning and cooking for my in-laws gathering here tomorrow. I set the turkey in the refrigerator on Sunday and I think it is still frozen. Yikes! Steve's class was reading aloud a story about a little girl who discovered how to make paint that made her invisible. One quiet little girl mispronounced a word in this sentence, "Irma mixed another batch of paint." She used the i-sound in batch. She let out a wail of horror and started sobbing. By the time Steve got over to her, tears and snot were running down her chin and she was wailing incomprehensibly. He took her out in the hall and consoled her, and she finally choked out that she needed glasses and that was what she saw and the horror of saying such a word in class and she never says bad words. I'm touched by her innocence, but the class of urban kids had erupted in laughter. I hope the little girl won't remember third grade by this incident. Steve was grading math papers and one boy answered a story problem with "Oh, my brain." File this under "I'm not surprised"
A woman from church delivered a very special gift to me this weekend, a truck full of horse manure. It is now spread on my large vegetable garden covered with a layer of mulched leaves. This bed is still heavy clay so it needs all the organics it can get. Luckily it is fenced; otherwise, my dog would consider it his manure and delight in rolling around in it. The spring peepers were in full chorus this weekend. This morning I decided that I wanted to post something more uplifting than the last post about the economy. 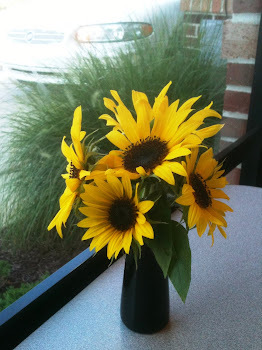 Perhaps pictures of my late fall garden, the apple harvest, the family cookout, a recipe. But no, I'm posting about my son's latest accident. Ricky just left the house to visit a friend in Parkview Hospital and the phone rings. "Mom, I'm in the Canyons and my head hurts and my car is in the ditch." Hoping for the best, I hopped in my car for the short ride to perhaps the most dangerous section of road in the county and found my son hurting but not injured. The car was smashed on every corner. I called 911 and they recommended an ambulance. A few minutes later I heard the siren and looked up the hill at the curve and saw a sheriff's car hit the same slick spot that sent Ricky into a guard rail and across the road into the ditch. Except the sheriff's car went airborne, knocking down a small tree, and ended up teetering on a ridge. The ambulance showed up along with a fire truck. Then six sheriff's cars and two tow trucks. Poor Ricky was just shivering in the icy rain that was falling. We're home. I'm monitoring Ricky in case of a concussion, but his vital signs are fine. He doesn't know how sore he is going to be tomorrow though. And we have to figure out the car situation so he can go to classes. And just why has our family been fiscally responsible? This post on Fort Wayne Politics most succinctly describes my own reaction to our financial crisis. I do not want an economic meltdown, but we are only postponing the need to address the unsustainable level of private, corporate and government debt. Steve and I have been fiscally responsible. We drive used cars. We remodeled our home (mostly ourselves) instead of buying a new home. We are debt-free. We saved for retirement. Then I opened my retirement fund statement this morning and determined that I will have to die ten years sooner than I planned and probably from starvation because inflation is gobbling up our income. That's my typical hyperbole, brought on by anger at the stupidity of our elected officials. Steve and I are well-equipped to face whatever the future brings; we have the skills, the common-sense, the temperament, the discipline, and the faith needed for tough times. I just wish I could find someone to vote for with skills, common-sense, and discipline. My "go-to" cookbook for years has been The Joy of Cooking, because it includes so much background information. For example, the intro to jellies includes information about pectin. By using natural pectin, instead of commercial pectin such as Sure-Gel, jellies require about half the sugar resulting in an intense fruit flavor. 1. 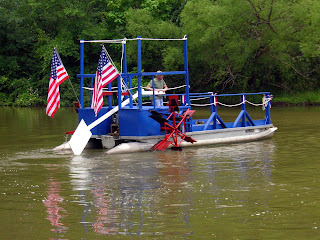 Take a ride on the river. 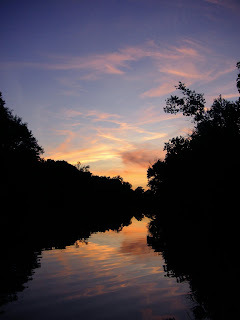 Make a date with your husband to go to the St. Joseph River in the Western Lake Erie watershed. Nose the riverboat into shore and cut off (prune?) the vines until you have a large pile on the floor of the boat. Remove the clusters. Step on numerous tiny grapes (they are smaller than blueberries), staining the floor with unique patterns of reddish purple. Watch the moon rise as you head back to the landing. Some sweet smooching is required at this point. 2. Ignore all warnings posted on the blog of an Internet friend. The first thing I had to do was take all those tiny grapes off their stems. This job reminded me of shelling peas. It takes forever and a day of cleaning those before you get enough to feed two people one time. 3. Spend five hours de-stemming the grapes. Yes, it takes a long time. Kylee is right. To break the monotony of this chore, make two batches of Concord jelly using some under-ripe fruit and half an apple to 8 cups of grapes. Making jelly with natural pectin requires a candy thermometer to know when the syrup reaches the sheet stage. If you are easily entertained, as I am, use the spoon method to test the jelly as well as the thermometer. Instead of the one or two minutes required with commercial pectic, this approach takes about 30 minutes of cooking. 4. Accept five bags of peaches and pears from brother. At this point, you may be getting slightly insane, so when your brother calls and offers you peaches and pears from his orchard, resist the offer. Remember you still have four bags of grapes left on your counter. I didn't resist. My son drove over and collected the fruit so it could sit on my table. I ran out of counter room. 5. Cook, drain and strain the fruit. The proportion of seeds to juice for wild grapes is about 10 times more than for Concord grapes. Empty the cooked wild grapes into a fine mesh strainer, listening for the clunk of seeds instead of the usual plop. For clear jelly, strain for 15 hours. Skip the straining if you are getting impatient or if you must use every last edible bit of these grapes. 6. Add sugar to grape juice and boil until it gels. Add the sugar gradually, tasting the syrup until it is the right combination of sweet and tart. The wild grapes will gel in about ten minutes. 7. Seal in small jars. It is important to use the smallest jars possible. This is precious stuff. Don't calculate the cost of each jar based on your consulting rate. You may weep. 8. Let your son lick the pan. And smile knowingly when he raves about the taste. My mother-in-law was diagnosed with lung cancer last fall and was given months to live. 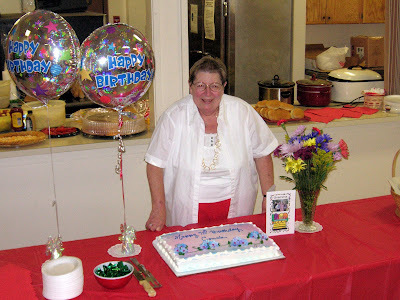 She said if she was still alive on August 30, her 75th birthday, she was going to have a huge party. 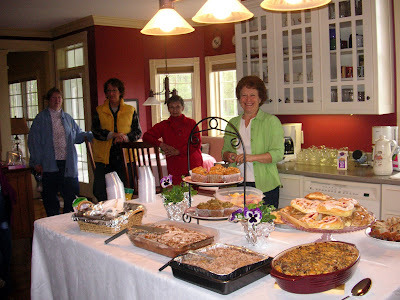 She responded well to the palliative chemotherapy so she invited friends and family to celebrate. 75 and Still Alive was the theme. I'm sure that attitude has helped in her battle these last few months. Last weekend, Steve and I finally slipped away to Michigan, just over the state line, to camp and canoe the Fawn River near Sturgis. 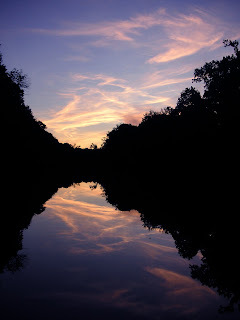 It has been likened to rivers in Canada by more than one nature writer. 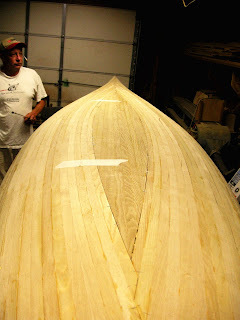 The night before we left, Steve finished the canoe. We had a great time with my brother, his girlfriend and four other couples camped in the crook of the Fawn near Sturgis. Two of my brothers have camped here by permission of the landowner for almost 30 years, but this was my first trip. We had such a good time that another couples trip was scheduled for October. 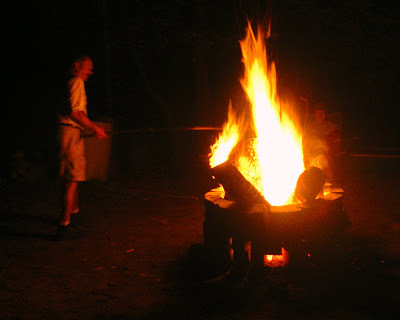 Brother John, whom I call Fireboy, is the fire architect. Sunday night he put a large hollow log upright on the fire and we watched flames shoot through the chimney and discussed which way it would fall. In this picture, he is bracing the chimney with several "small" logs in the foreground. Here's a nice post by a marketing person from Indy (shorthand at work for Department of Natural Resources) who visited the site last week. I gave her a tour of the Cabin and gardens and I see some of my viewpoint of Gene Stratton-Porter reflected in this post. I'm curious on how this would read if another interpreter gave her the tour. Why wait until fall? Let's celebrate the harvest season now. Locally grown produce is highlighted in the following account of my harvest to date. I can't keep up with the green beans. I am filling the freezer with parboiled tender beans but I had a lot of big tough beans. Yesterday I decided to make soup stock with the beans. I added the squash clubs, tomatoes and cabbage given to me by my father-in-law, some aging celery and carrots from the fridge, an onion, and garlic. Steve suggested I throw in some beef so in went two neck bones from the beef we purchased last winter. I ended up having to use two large soup pots. I cooked it down overnight and this morning removed the solids and am now boiling down the stock to freeze for soup base next winter. Last week, my son, his girlfriend and I picked 15 pounds of blueberries. I flash froze them and now they are in the freezer waiting for me to make blueberry pancakes, blueberry cobbler and add to my breakfast yogurt. My father-in-law gave me 6 green peppers from his garden. We don't eat a lot of green peppers, except as flavoring. So these have been chopped, flash frozen and put in little baggies for future use. My squash and zucchini plants didn't make it. They just withered away. But don't fear, I have a bounty of zucchini from family and friends. They are piled up in the fridge and I suppose I will make zucchini bread, which my husband likes so much. Going back to the spring crops, I have enough chopped rhubarb frozen for two pies and several bags of spinach. 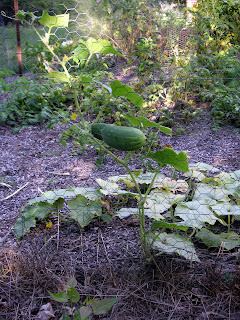 Early this spring, there was a garden blogger challenge to plant something new in our vegetable gardens. I didn't respond, but it did give me the courage to plant five 12-foot rows of sweet corn. The silks are turning brown and soon I will be awash in fresh corn. For some reason, I planted 12 Roma tomato plants. Oh, I remember, I was going to make sauce. Other green tomatoes waiting to be harvested in include pink brandywine, volunteer cherry tomatoes and a heirloom green striped tomato. The last tomato was from seeds I saved last year, another first for this new vegetable gardener. 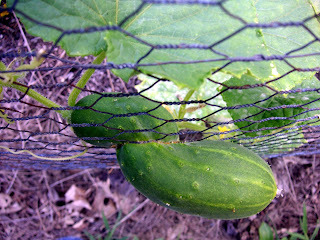 I have 6 cucumber vines and have harvested four cukes already. When these start coming on fast, I want to make bread-and-butter pickles again. My family loved them last year. I'm hoping the red peppers mature with the Roma tomatoes so I can add them to the sauce. I have six red potato plants in tubs. I'm adding soil and waiting for new potatoes. Aren't they suppose to ripen with green beans so I can make my mother's German potato salad? The blackberries are starting to ripen and within the week I should either freeze them or make jam. I'm also checking on the grapes. There are large clumps but still a solid shade of green. I planted red raspberries this spring and one is forming berries. I suspect all that I will harvest will be eaten as they are picked. I think that is it. I should be busy this next month or so, but will enjoy the fruits (literally) of my labor all winter long. I'm not documenting this canoe building very well, but here are the pictures after all the strips were laid and the staples removed. Since these pictures, Steve did a lot of detailed work on the stems and laid the outer stems. I think sanding, sanding and more sanding is next. He will be doing most of that by hand. This shows the "swoop" of the stern. The bow is more pronounced. The "football keel" has been integrated. 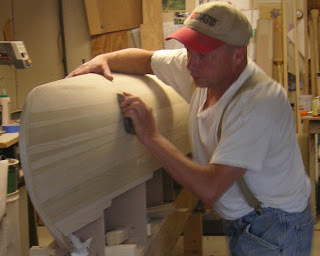 Here he is sanding the end of the strips level with the inner stem. End grain is tough and no one will ever see it, but it has to be perfectly aligned so the outer stem will fit flush. 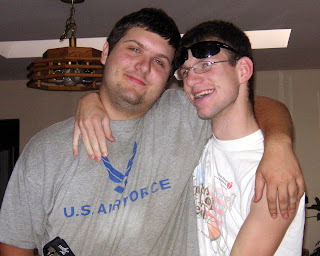 Ricky is graduating this summer. 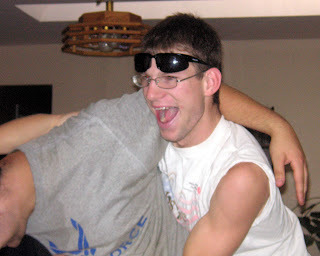 He was three credits short, but wanted so bad to graduate with his class and HAVE A PARTY. So he took three classes this summer, because we refused to have a graduation party without, you know, him actually graduating. He finished his English class a few weeks ago and finished his health class tonight. That just leaves Economics, which should be done tomorrow night. The party is August 2 and he just asked me, "Mom, you'll make me a scrapbook, right?" Yikes! I've tried scrapping and even attended a scrapbook night at church once. Five hours later, the other women had completed numerous pages and I completed just one. I dinked around with the design and then had to write a narrative, while they just slapped the pictures on the page with one or two words. To complicate matters, I've printed very few pictures the last two years. I think I'll put the recent pictures into a digital frame and then make posters of the major events and perhaps make a few scrapbook pages. Probably in desperation I will just throw the rest of the pictures in an album. 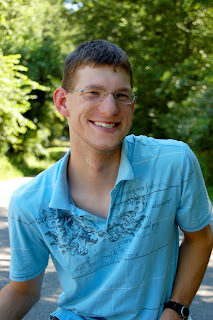 His cousin, who graduated in the same class, took these pictures of Ricky for me. 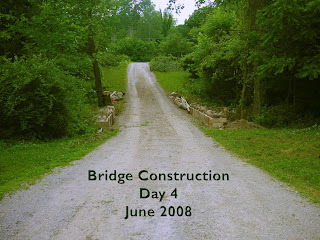 Since I created a new tag called Projects for the bridge and canoe projects, I had to share some of my projects. No, not the apron. It's still uncut, but not forgotten. My great niece has an apron in a similar style which I plan to use to resize the Grandma's pattern. 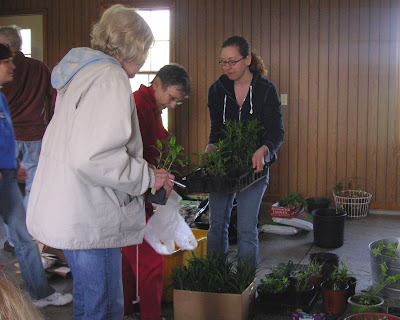 One project was arranging the planting of over 100 trees at The Third Place this spring. It was an intergenerational event. They posted pictures on the church website and I especially like the one of the girls right in the hole they dug. These same girls, not 30 minutes earlier, said they didn't want to get dirty. We've had lots of rain this summer, which is a good thing since there is no way we can water the trees on the far end of 30 acres. With Steve teaching and not "studenting," we've added another dimension to our wardrobe, necessitating giving up part of our bedroom for a larger closet. Steve's portion of this project is almost complete and now I need to start painting. We are painting the bedroom four different colors. I hope it works. I have also been hunting for new curtains, without any luck. 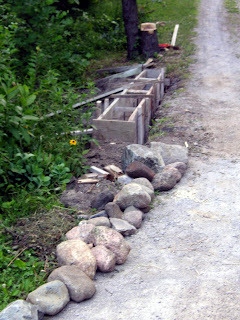 Of course, there are always numerous garden projects in various stages. Ron dug out some overgrown shrubs by the back deck and now I need to decide what to plant there. I've planted an even bigger veggie garden and this is the first year I've grown corn. I created a new bed in my front yard and planted it. But these are all normal garden activities for me. 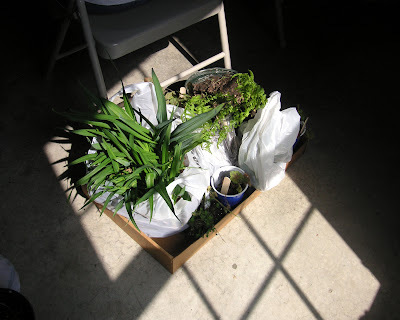 My project involves my growing interest in native plants. We have always let our pond edges grow naturally, resulting in volunteers of cattails, sedges, Queen Anne's Lace, milkweed, black-eyed susans, and even Joe Pye Weed. 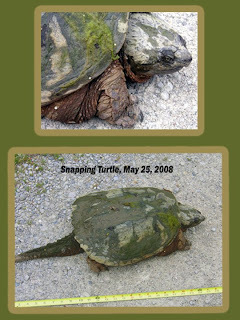 We did plant blue flags many years ago and they have claimed a large portion of the north end of the pond. Last year I planted three starts of yellow flags. However, the shallow end of the pond is sawgrass and cattails. 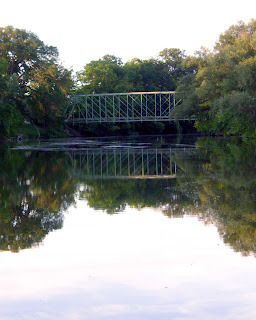 It is also the first thing you see after crossing the stone bridge. Last fall I collected seeds from swamp hibiscus, pink turtlehead and cardinal flowers, all plants that love their feed wet. At the encouragement of Kylee, I winter sowed the seeds and they grew! So I've been hacking away at the growth to plant them on the shallow end of the pond. Let me tell you, removing turf and amending clay soil is easy compared to sinking in muck and getting scratched by the grasses to battle swamp weeds. In addition to the plants I started from seed, I planted Queen of the Prairie. If this works out, it will be breathtakingly beautiful. 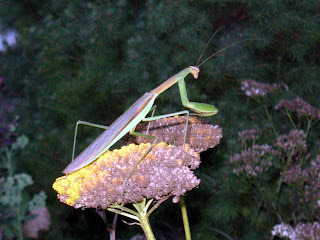 My brother is not the only craftsman at work around my home. 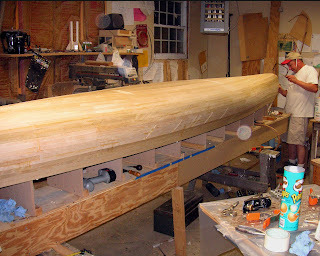 My husband has started his second strip canoe. I gave him the plans and forms for a Voyager canoe for Christmas. 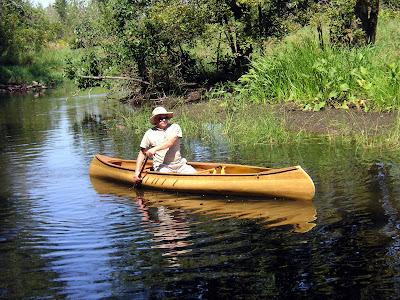 He decided to make his own strips from sassafras, a traditional wood for canoes. 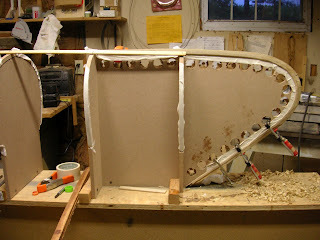 He started by cutting the planks into strips, planing and sanding them and then he put beads and coves on every strip. 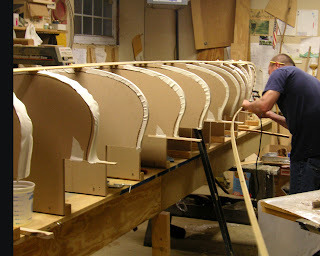 The next step was to set up the forms on the strongback and then mold the inner and outer stems. Here he is applying the first strip to the form. 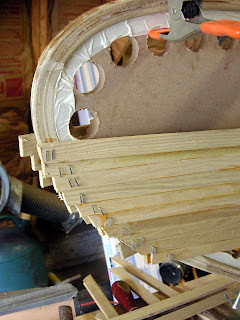 He staples the strips to the form and glues between the strips. 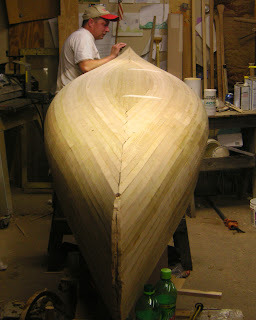 After laying about four strips on each side, he laid the "football" on the keel. 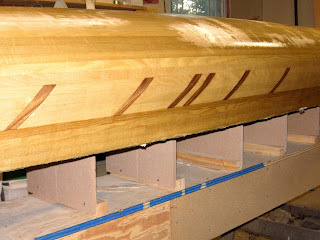 This makes the keel stronger; otherwise, he would have numerous strips ending at the keel line due to the shape of the canoe. 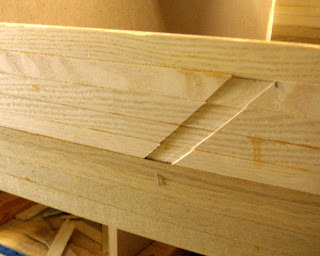 The next strips on the side will have a walnut inlay and he cut the design into the next three strips. Then comes a tricky part. 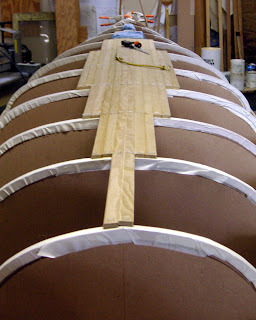 He had to add tapered strips to each end. You can see one of the tapers in this photo, the second strip down. I think of these as reverse darts. He's out in the shop now laying on more strips and more tapers. The third tier of rocks have been lain. 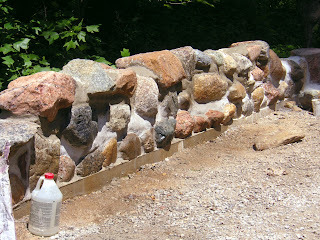 This is the north wall of the bridge. And this is the south wall. 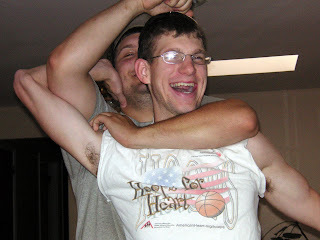 My brother John is wrestling a large rock in place. He placed flat rocks at each end of the arched walls for seats and this seat will have a backrest. That boy sure is strong, always was. 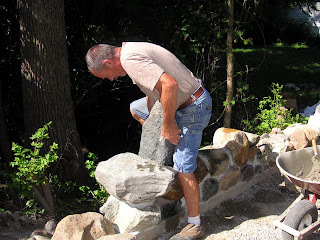 I can't believe the way he lifts and places those large stones. 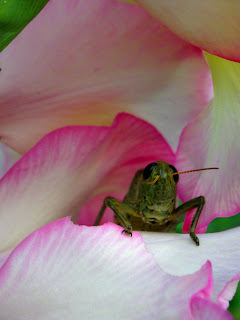 Before I took this picture, I asked him if I could help and he just gave me a look. 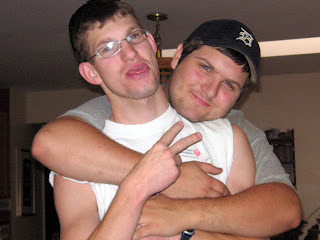 John is two years younger than me and the oldest of my three younger brothers. 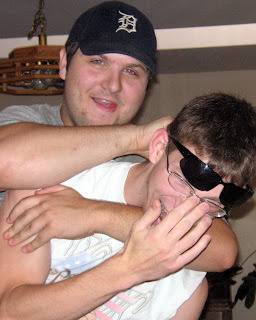 I remember walking to the house from the school bus and turning around to punch him as hard as I could in the belly when we were both in middle school. He just looked at me (probably the same look as he gave me today) as I rubbed my hurt hand. I clearly remember thinking, "Time to change strategies, Martha." 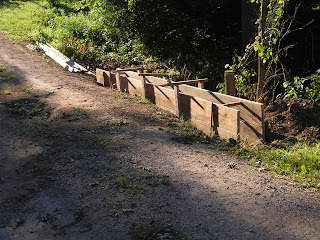 It was time to do something about the bridge over Usually Not Creek. 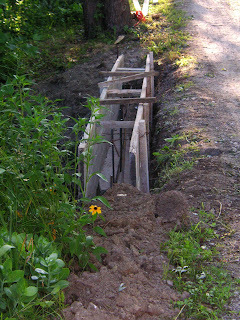 The sides were eroding and gravel was washing out in the center of the bridge. 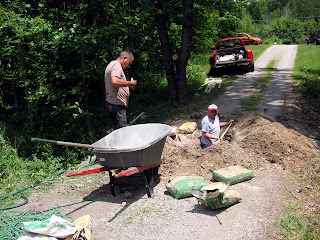 We asked my brother John to fix the washout between the two culverts and to build wing walls to prevent the erosion along the side. John used a pick and shovel to dig out the center of the driveway and found a gaping cavern created by a large cottonwood root. 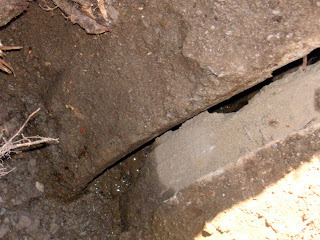 The picture shows the gap between the culverts and eroded concrete from the root. 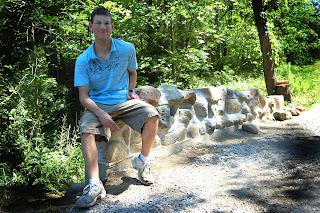 John and I both came up with the idea of an arched fieldstone bridge. My husband was thinking of a simple wooden structure. Steve shrugged and let the sibs take the bridge where we wanted. 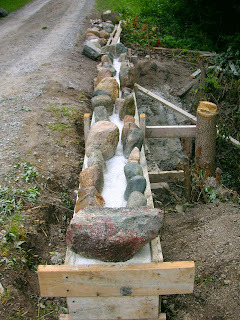 The boys and I gathered all the fieldstone we had (shown below) which will only do the first row of one side of the bridge. 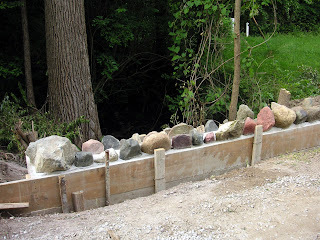 A volunteer at work told me about several large piles of stones in her woods which I could have. Perfect! We will probably have enough to finish the bridge. 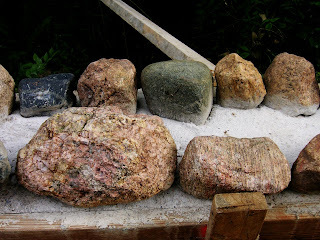 I love looking at this hint of what is to come and searching through the stone for the best specimens. 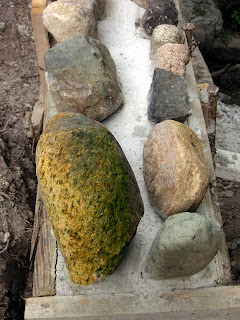 We still have several truckloads of stone to pick-up. I'm using the term "we" rather loosely in this narrative. John is taking the next two weeks to help move his daughter and family to Colorado where her husband is doing his fellowship in pediatric neurosurgery. I'm sorry they will be so far away. John's granddaughters are both three, Sophia is three years and Victoria three months. They will likely not remember their GREAT aunt. During the next two weeks, I will be poring over stones deciding which ones I want on top. I'm toying with the idea of embedding some other things to make this uniquely ours. My husband already has several fossils selected. In this post, I had a mystery plant in the woods. My sister guessed an immature pokeweed and Kylee guessed twinleaf. I found the same plant in the wildflower bed at work and the site's naturalist made the identification. It is Blue Cohosh (Caulophyllum thalictroides). Twenty years ago, I was faced with empty beds after I ripped out the overgrown shrubs in my newly purchased home. So I came up with a scheme for people to give me plants, plants that grew well in this area. 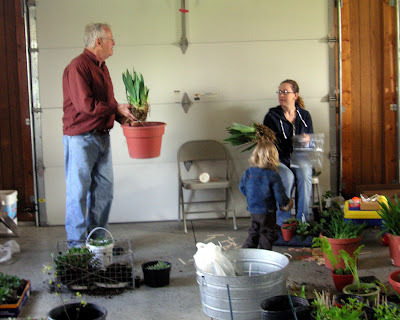 And so the plant exchange party began. I last hosted "my" garden party in 2004. 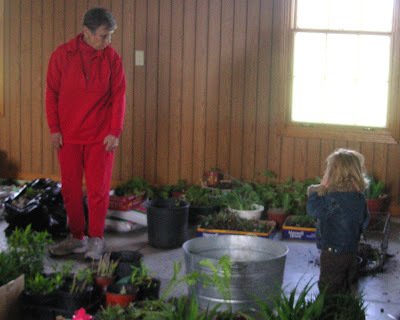 Since then, Beth, the lovely lady in green in the picture below, opened her home for the plant exchange. After we eat and socialize and scope out the plants, the exchange begins. This year, we moved to the garage because of the cold wind blowing across their lovely farmland. Here, our host is confessing to iris theft from the church and offering up bearded iris. Next Vern brings out some tender bulbs. The lady selecting the bulbs flew in from Philadelphia for the party so you know how much fun we have. 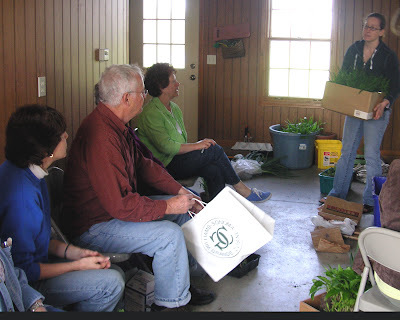 Jennifer, my niece, has everyone's rapt attention as she explains the "garden in a box" that she brought. 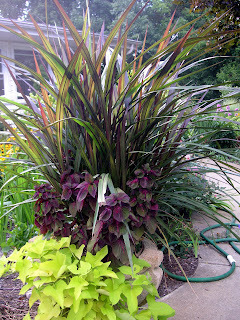 She brought coral bells for the front, hosta for the mid-section and garden phlox for the back. There may have been more but that's all I remember. She did a good sales job, no wonder she is in marketing. Here is one person's bounty. 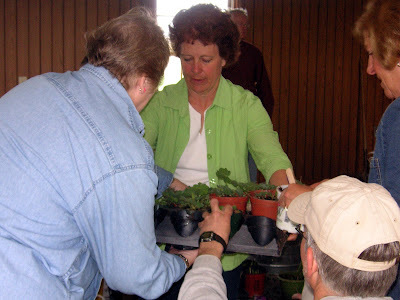 Donna is getting started with the plants she brought. I've gotten to know Donna during the last year as we landscaped the church's new building and really enjoy her and respect her knowledge. 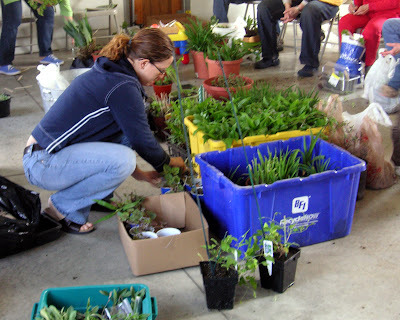 Look at all the plants waiting to be given away. Donna's helper is Jennifer's daughter, Emily, my truly great niece. 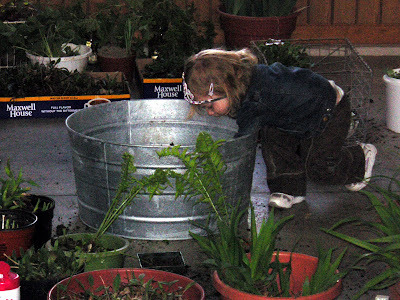 Here's Emily with my tiara checking out the tub, perhaps for earthworms or maybe she is making a wish. Beth crowned me Princess Plants-a-Lot (P-Lancelot) in honor of 20 years of the plant exchange. Beth offers up a hot item. Here's an idea of the sheet number and variety of plants. Over the years, we've learned to limit the rampant growers, and people brought things like toad lilies, filipendula and sweet autumn clematis. And a good time was had by all. The best thing is that you divide several plants to give away and you come home with literally hundreds of dollars of plants. This year I brought home garden phlox (I have is purple phlox and am hoping for some white and pink), rose flowered mother-of-thyme, calendula starts, centaura, hosta, and knautia. It's just unfortunate that I don't have more empty beds so I wouldn't have to show such restraint.